First of all, yay for that cover! I like it much better than the temporary one on my ARC! 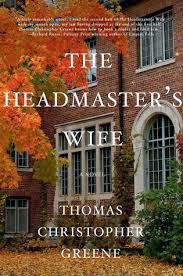 The Headmaster's Wife is an interesting novel with interesting structure. The first part of the book is a story told through eyes of the headmaster "after something has happened" It feels like a typical story in many ways but hints begin to emerge, even through his foggy narration, that not everything is as it seems. The second part of the novel is the story of the headmaster's wife...and yet. Even this is incomplete and it isn't until a third POV is added at the end of the book that we finally get a complete picture of what has happened. I think it's a book about how grief can shatter the mind and heart and even play a game with you where relive the moments where you were your lesser self that led to your present pain over and over. That's a horrible sentence, but I don't know how else to put it! This is a great book, a quick and thoughtful read, but I can't really say too much more about it for fear of spoiling it.